↑ "Valor Awards for James Walter Little". Gannett Company. 2011. สืบค้นเมื่อ 25 June 2013. ↑ Futrell, Robert F. (1997). The United States Air Force in Korea, 1950–1953. United States Government Printing Office. pp. 99–101. ISBN 9780160488795. ↑ Hoyt, Edwin P. (1984). On to the Yalu. Stein and Day. p. 58. ISBN 0812829778. ↑ • Gimpo-Beijing air route to open in July. South Korea News (26 April 2011). Retrieved on 12 July 2013. ↑ • Songshan to begin direct flights to Gimpo in Seoul. Taipei Times (30 April 2012). Retrieved on 6 March 2015. ↑ "Office Location." (Archive) Aviation and Railway Accident Investigation Board. Retrieved on 15 February 2012. 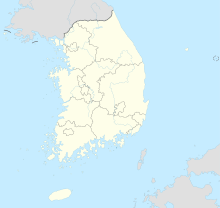 "CVR/FDR analysis and wreckage laboratory : Gimpo International Airport 274 Gwahae-dong, Gangseo-gu, Seoul, Korea 157–711"
↑ "KAIB/AAR F0201." Korea Aviation Accident Investigation Board. 4/168. Retrieved on 18 June 2009. "The main office is located near Gimpo International Airport, and the flight recorder analysis and wreckage laboratories are located inside the airport." หน้านี้แก้ไขล่าสุดเมื่อวันที่ 5 มกราคม 2560 เวลา 22:36 น.